With men’s grooming getting a 21st century kick up the behind, you can understand why Porters has decided to expand further into this market and move things up a gear or two. Porters has decided to raise the bar in men’s grooming by taking an unashamedly masculine approach. With their desire and passion to provide the ultimate men’s grooming experience. This means your visit to Porters will be an ‘‘experience to savour’’. On arrival, you will immediately appreciate you’re in the right place, with the ambiance created by the beautifully hand-crafted interior which takes its design cues from a gentler era and then throws a modern twist all over it. Exposed brick work and bespoke joinery, touches of antiqued brass and copper, Edison filament bulbs suspended from the ceiling, all add to the eclectic and intimate atmosphere. Take a seat and relax while you’re offered a complimentary drink – anything from coffee and tea infusions to a cold beer or scotch. Once suitably refreshed and seated in one of the exquisite vintage barber chairs you will immediately notice that the barbers are keen to listen to your thoughts and ideas. You are guaranteed to be listened to, advised and be extremely well looked after! Now for the real business: by using old school traditional techniques and by incorporating sinks at each work station with traditional barber chairs that can rotate and move in all directions, you might think you’d be spun round and tilted back for the hair wash. WRONG. These guys go for the front dunk! All part of the ‘experience’… simply listen to the copilot and it will be a smooth flight.  Porters is a top class barbering establishment, that understands the needs of the modern gentlemen. Put simply, it’s been conceived by and engineered for men. Come in and take a look for yourself; you won’t be disappointed. So if you need a bit of a tidy up, a totally new look or just a beard trim make sure you visit soon. We have a saying at Porters: “Always keep it handsome and remember salons are for girls”.